Big Cities Should Be Eliminated? Dilworth Park is located adjacent to the Philadelphia City Hall. 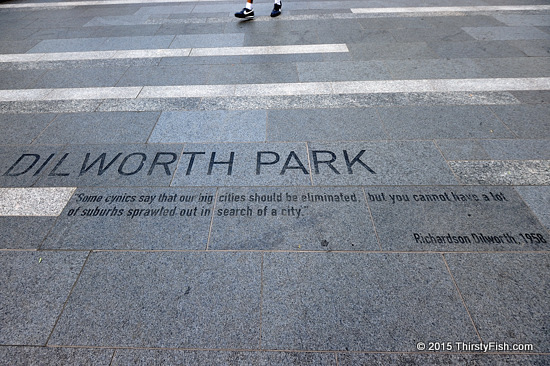 The park is named after Richardson Dilworth, a former mayor of Philadelphia. "Some cynics say that our big cities should be eliminated, but you cannot have a lot of suburbs sprawled out in search of a city". I'm one of those "cynics" - for many good reasons. When you pack millions of people into a limited space, you have a disaster waiting in every respect. All resources and food has to be imported from greater and greater distances. Inner city problems such as crime, inequality and pollution are inevitable. The hectic and unnatural lifestyle the city demands takes a toll on the mental state of its residents, many of whom see shrinks and take psychiatric medication. And to feed their ever growing cities, governments start wars with other nations to control critical resources. One can write dozens of books proving the "cynics" right and shills like Dilworth wrong. Of course "the civilized" have to defend civilization, which is another word for ever-expanding cities. As Lewis Mumford noted, if modern cities carry on sprawling into megalopolises as they did in the Roman Empire, they will collapse. I would add, with cities, civilization will collapse.